My experience as an Au Pair in Chile has been a really good one so far. But let me start at the beginning. When I first started investigating and organizing everything, I was pleasantly surprised that I received such great support from Chile Inside (and still do here in Chile). My “guardian” was always answering my questions – however trivial they might have been – very quickly and gave me a feeling of security. The placement itself also went very smoothly and quickly. I received several offers from which I could choose, which was really nice. 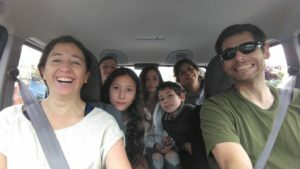 All families seemed friendly and the decision was a difficult one, but I chose a family in Chile’s capitol Santiago and am very happy about it! I am now part of this family that includes my host parents, two girls, one boy, one “nana” from Paraguay, two cats and two turtles – plus some frequently visiting relatives. Adapting to the new and very different culture was challenging, but also a great experience. It definitely broadens the horizon and gives you a new perspective. There are a few tips I can share: Don’t be scared by the differences and don’t compare everything to your home. And also, don’t be discouraged by language barriers! I spoke very little Spanish when I came here and noticed that people are very eager to help you understand. I take care of three teenagers here and they definitely have a great time making me pronounce tricky Spanish words! And I, on the other hand, have a great time teaching them German. A few things I learned to far: Empanadas are to die for. Swimming in the Pacific Ocean is chilly, but fantastic. Terremoto is an earthquake, but also a very sweet cocktail with ice cream on top. In general: get used to things being very sweet! Chilean Spanish is extremely different from standard Spanish, but also very funny. Yes, daisies, orange trees, cows, colorful lizards and cactuses can all occur in one place. Dogs are everywhere. Wear sunblock – always! Mote con huesillo is super convenient, because it’s a snack and a drink at the same time. No matter where you go, you’ll find someone that speaks German. When invited to a party, don’t be on time. The Fiestas Patrias make it easy to fall in love with this place. 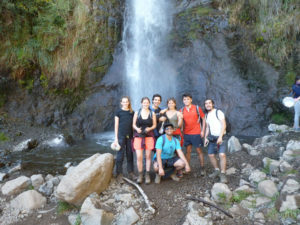 Hiking here is challenging, but really awesome – especially when you have a fun crew of locals that can give you inside tips and information about the area. I am looking forward to five more months in this fascinating country and can only recommend it to anyone looking to experience South America in a very unique way, which allows you to really get in touch with locals and get to know their way of life.